EDINBURGH, SCOTLAND--(Marketwire - Feb 26, 2013) - Setting a stylish pace among meeting venues in Edinburgh, the newly refurbished Pentland Suite has opened its doors fully equipped and dressed to the nines for hosting a vibrant array of corporate functions, social events, holiday gatherings and elegant wedding celebrations. Located inside the prominent Edinburg Marriott Hotel, this new upscale venue is boasting rich, bold colors and sophisticated lighting options to meet the needs of nearly any occasion. Whether hosting an extravagant banquet or stepping forward with an important presentation, the Pentland Suite is one Edinburgh hotel space that shines with impeccable detail to create an ambience that is sure to please. Just coming off an elaborate £378,000 refurbishment, this bold new suite has been transformed into an upscale choice among wedding venues in Edinburgh and is sure to set the business world on edge with the dedicated support of event managers, professional catering and a litany of business equipment and services. With the capability of serving up to 200 persons for a special event, the Edinburg Marriott is fully prepared to roll out the red carpet so guests will feel special from the moment they arrive. New furnishings and handsome fittings enhance the vibrant color schemes and with the assistance of this Edinburgh four-star hotel's highly trained staff, there will be no detail left unattended, allowing event planners and hosts to participate in activities and enjoy their guests without worrying about details. In addition to the Pentland Suite, the Edinburgh Marriott hotel also features nine breakout rooms and on-site exhibition space, special packages for "Green Meetings" and intricately designed event menus with customizing options to set the stage for inspirational meetings and chic social gatherings. And, with value-added amenities such as free on-site parking and complimentary Internet access, event planners enjoy exceptional savings and the benefits of Marriott Rewards whether planning business or social events. For pre-event planning, the hotel features a variety of online tools, checklists and guides to help in calculating costs, reviewing venue floor plans and set-up examples so planners can quickly complete an RFP, also available online. Online information is available at http://www.marriott.com/hotels/travel/edieb-edinburgh-marriott-hotel/ or planners may contact the hotel sales team at 44-131-314-7501. The Edinburgh Marriott Hotel welcomes both business and leisure travellers with exciting four-star luxury lodging beaming with amenities, well-appointed Edinburgh hotel rooms and spacious suites. Conveniently located just five minutes from Edinburgh International Airport, guests will find themselves ideally situated for attending rugby games at Murrayfield Rugby Stadium, attending prominent events such as the Royal Highland Show and Edinburgh Fringe Festival or sightseeing historic sites and popular attractions. On-site amenities include an International restaurant, coffee house, business centre, fitness facility, indoor pool and the relaxing services of the hotel's own Solas Spa Therapies. 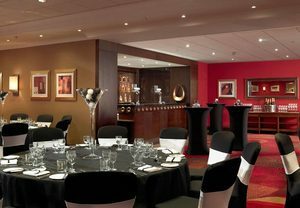 Setting a stylish pace among meeting venues in Edinburgh, the newly refurbished Pentland Suite has opened its doors fully equipped and dressed to the nines for hosting a vibrant array of corporate functions, social events, holiday gatherings and elegant wedding celebrations.